Il Piomboni Camping Village ha ottenuto il riconoscimento di Green Tourism, l’etichetta ambientale e di qualità del turismo più credibile al mondo! Qui al Piomboni Camping Village siamo consapevoli del forte impatto del turismo sull’ambiente e riconosciamo la nostra responsabilità nel gestire e nel ridurre il carico sull’ambiente senza compromettere la qualità del soggiorno dei nostri ospiti. Sviluppare un approccio responsabile anche nell’alimentazione, utilizzando - per quanto possibile - cibi locali, di stagione, biologici ecc. Tenere conto degli obiettivi ambientali anche nella programmazione di tutti i nostri futuri investimenti (ristrutturazioni, nuove proposte ai clienti, innovazioni). Piomboni Camping Village GOT the Green Tourism AWARD, the world’s most credible Sustainable Tourism Programme for quality -oriented holiday! Here at Piomboni Camping Village we appreciate tourism impacts on the environment. We recognise that we have a responsibility to manage and minimise the contribution that our activities and services make without compromising the quality of our guests’ stay. Identify and monitor the significant impacts of our activities. Set targets and objectives in order to reduce these environmental impacts and develop procedures to achieve them. Comply with relevant legislation and regulations relating to our environmental impact. Prevent pollution and minimise our consumption of utilities and resources. We endeavour to reduce carbon emissions, effluents and waste to disposal facilities and aim to recycle where possible. Ensure that our environmental policy is communicated to all involved in Howe Keld. That contractors and suppliers are encouraged with responsible approaches to the environment, staff are trained and guests given appropriate information. Develop a responsible approach to sourcing food by supporting local, seasonal, organic and fair-trade overseas communities where practical. Work with national and local bodies in promoting issues with regards to the environment. Strive for continual improvement in our environmental performance. Consider environmental objective whenever planning investment for the future (restructuring, new proposal s to guests, innovation). We have preparted for our Guest "the green events notice-board to promot all green events of the area. Our goal is to keep a low impact on the environment when doing new installations or renovations (use of electrical vehicles, avoid wasting water or abusing of electrical power). 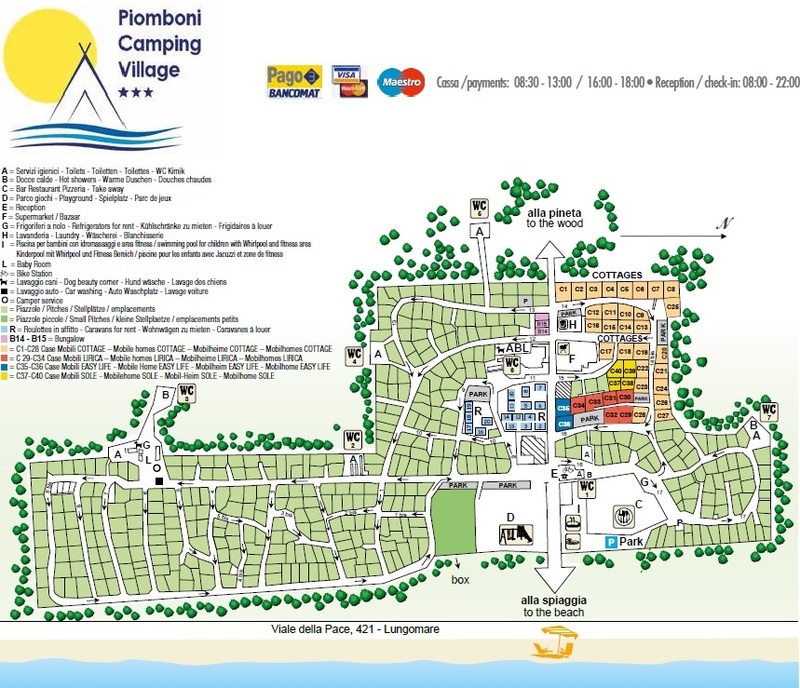 Piomboni campsite is beautifully placed near Marina di Ravenna in the Pineta which is part of the Po Delta park. Owners environmental awareness can be seen in management and renovating policies, such as tree planting, the use of construction materials in site and water saving devices in public toilets/shower. Other interesting measures include A/C timer for the bungalows, an electric golf car for the staff and a well kept eco area at the entrance of the campsite. The staff is deeply involved in promoting guided tours to the pineta and a number of excursions (either by bike or with public transports) to Ravenna and its heritage.